This application was born after a student trainee, Pedro Vicente, spent his Summer at my company Aliatron and did a technical project with a 8051-based robot “Robo-51” from Inex . Pedro has already published here in this blog, his work that is based on remote control of a robot with bluetooth. Use Processing sketch to create a virtual gamepad that controls a bluetooth-enabled robot, in this case a Robo-51 from Inex. The virtual gamepad must control the robot using serial communication capabilities of a bluetooth module (ZX-Bluetooth). Voice-enable the gamepad with TTS capabilities of Windows. A 8051 robot “Robo-51” (could be any other micrcontroller) with ZX-Bluetooth module, running a firmware for bluetooth control (or any other serial control), and PC with Windows and Processing software. the commands: in our case they are d for forward, a for backwards, c for leftwards, b for rightwards and s for stopping. Pedro Vicente, mentioned above, has published here the whole project envolving the 8051-based robot “Robo-51” and bluetooth. In fact the virtual gamepad can function through any serial connection to any micrcontroller. The commands and the serial port have to be adapted in the sketch. Serial communciations library, and other libraries in Processing, offer enormous potential in adding interactivity to electronic projects. 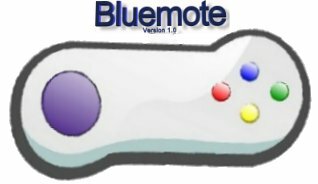 Bluemote, the virtual gamepad that has been explained here is an example of how easy it is to make electronic projects to talk and interact with the environment. This entry was posted in Electronic Projects, Programming, Robotic Projects and tagged BlueMote, Bluetooth, Inex, Processing, Robo-51, Robot Control, Virtual Gamepad, Zx-Bluetooth. Bookmark the permalink.